For biographic motion picture, see Biographical film. Aggregate of microorganisms in which cells that are frequently embedded within a self-produced matrix of extracellular polymeric substances (EPSs) adhere to each other and/or to a surface. Note 1: A biofilm is a system that can be adapted internally to environmental conditions by its inhabitants. Note 2: The self-produced matrix of extracellular polymeric substances, which is also referred to as slime, is a polymeric conglomeration generally composed of extracellular biopolymers in various structural forms. Biofilms may form on living or non-living surfaces and can be prevalent in natural, industrial and hospital settings. The microbial cells growing in a biofilm are physiologically distinct from planktonic cells of the same organism, which, by contrast, are single-cells that may float or swim in a liquid medium. Biofilms can form on the teeth of most animals as dental plaque, where they may cause tooth decay and gum disease. Microbes form a biofilm in response to various different factors, which may include cellular recognition of specific or non-specific attachment sites on a surface, nutritional cues, or in some cases, by exposure of planktonic cells to sub-inhibitory concentrations of antibiotics. A cell that switches to the biofilm mode of growth undergoes a phenotypic shift in behavior in which large suites of genes are differentially regulated. Biofilms are hypothesised to have arisen during primitive Earth as a defence mechanism for prokaryotes at that time, as the conditions of primitive Earth were too harsh for the survival of prokaryotes. Biofilms protect prokaryotic cells by providing them homeostasis encouraging the development of complex interactions between the biofilm cells. The formation of a biofilm begins with the attachment of free-floating microorganisms to a surface. The first colonist bacteria of a biofilm may adhere to the surface initially by the weak van der Waals forces and hydrophobic effects. If the colonists are not immediately separated from the surface, they can anchor themselves more permanently using cell adhesion structures such as pili. Hydrophobicity can also affect the ability of bacteria to form biofilms. Bacteria with increased hydrophobicity have reduced repulsion between the substratum and the bacterium. Some bacteria species are not able to attach to a surface on their own successfully due to their limited motility but are instead able to anchor themselves to the matrix or directly to other, earlier bacteria colonists. Non-motile bacteria cannot recognize surfaces or aggregate together as easily as motile bacteria. During surface colonization bacteria cells are able to communicate using quorum sensing (QS) products such as N-acyl homoserine lactone (AHL). Once colonization has begun, the biofilm grows by a combination of cell division and recruitment. Polysaccharide matrices typically enclose bacterial biofilms. In addition to the polysaccharides, these matrices may also contain material from the surrounding environment, including but not limited to minerals, soil particles, and blood components, such as erythrocytes and fibrin. The final stage of biofilm formation is known as dispersion, and is the stage in which the biofilm is established and may only change in shape and size. The development of a biofilm may allow for an aggregate cell colony (or colonies) to be increasingly resistant to antibiotics. Cell-cell communication or quorum sensing has been shown to be involved in the formation of biofilm in several bacterial species. Dispersal of cells from the biofilm colony is an essential stage of the biofilm life cycle. Dispersal enables biofilms to spread and colonize new surfaces. Enzymes that degrade the biofilm extracellular matrix, such as dispersin B and deoxyribonuclease, may contribute to biofilm dispersal. Enzymes that degrade the biofilm matrix may be useful as anti-biofilm agents. Recent evidence has shown that a fatty acid messenger, cis-2-decenoic acid, is capable of inducing dispersion and inhibiting growth of biofilm colonies. Secreted by Pseudomonas aeruginosa, this compound induces cyclo heteromorphic cells in several species of bacteria and the yeast Candida albicans. Nitric oxide has also been shown to trigger the dispersal of biofilms of several bacteria species at sub-toxic concentrations. Nitric oxide has the potential for the treatment of patients that suffer from chronic infections caused by biofilms. It is generally assumed that cells dispersed from biofilms immediately go into the planktonic growth phase. However, recent studies have shown that the physiology of dispersed cells from Pseudomonas aeruginosa biofilms is highly different from those of planktonic and biofilm cells. Hence, the dispersal process is a unique stage during the transition from biofilm to planktonic lifestyle in bacteria. Dispersed cells are found to be highly virulent against macrophages and Caenorhabditis elegans, but highly sensitive towards iron stress, as compared with planktonic cells. Biofilms are usually found on solid substrates submerged in or exposed to an aqueous solution, although they can form as floating mats on liquid surfaces and also on the surface of leaves, particularly in high humidity climates. Given sufficient resources for growth, a biofilm will quickly grow to be macroscopic (visible to the naked eye). Biofilms can contain many different types of microorganism, e.g. bacteria, archaea, protozoa, fungi and algae; each group performs specialized metabolic functions. However, some organisms will form single-species films under certain conditions. The social structure (cooperation/competition) within a biofilm depends highly on the different species present. The EPS matrix consists of exopolysaccharides, proteins and nucleic acids. A large proportion of the EPS is more or less strongly hydrated, however, hydrophobic EPS also occur; one example is cellulose which is produced by a range of microorganisms. This matrix encases the cells within it and facilitates communication among them through biochemical signals as well as gene exchange. The EPS matrix also traps extracellular enzymes and keeps them in close proximity to the cells. Thus, the matrix represents an external digestion system and allows for stable synergistic microconsortia of different species (Wingender and Flemming, Nat. Rev. Microbiol. 8, 623-633). Some biofilms have been found to contain water channels that help distribute nutrients and signalling molecules. This matrix is strong enough that under certain conditions, biofilms can become fossilized (Stromatolites). Bacteria living in a biofilm usually have significantly different properties from free-floating bacteria of the same species, as the dense and protected environment of the film allows them to cooperate and interact in various ways. One benefit of this environment is increased resistance to detergents and antibiotics, as the dense extracellular matrix and the outer layer of cells protect the interior of the community. In some cases antibiotic resistance can be increased a thousandfold. Lateral gene transfer is often facilitated within bacterial and archaeal biofilms and leads to a more stable biofilm structure. Extracellular DNA is a major structural component of many different microbial biofilms. Enzymatic degradation of extracellular DNA can weaken the biofilm structure and release microbial cells from the surface. However, biofilms are not always less susceptible to antibiotics. For instance, the biofilm form of Pseudomonas aeruginosa has no greater resistance to antimicrobials than do stationary-phase planktonic cells, although when the biofilm is compared to logarithmic-phase planktonic cells, the biofilm does have greater resistance to antimicrobials. This resistance to antibiotics in both stationary-phase cells and biofilms may be due to the presence of persister cells. Biofilms are ubiquitous in organic life. Nearly every species of microorganism have mechanisms by which they can adhere to surfaces and to each other. Biofilms will form on virtually every non-shedding surface in non-sterile aqueous or humid environments. Biofilms can grow in the most extreme environments: from, for example, the extremely hot, briny waters of hot springs ranging from very acidic to very alkaline, to frozen glaciers. Biofilms can be found on rocks and pebbles at the bottoms of most streams or rivers and often form on the surfaces of stagnant pools of water. Biofilms are important components of food chains in rivers and streams and are grazed by the aquatic invertebrates upon which many fish feed. Biofilms are found on the surface of and inside plants. They can either contribute to crop disease or, as in the case of nitrogen-fixing Rhizobium on roots, exist symbiotically with the plant. Examples of crop diseases related to biofilms include Citrus Canker, Pierce's Disease of grapes, and Bacterial Spot of plants such as peppers and tomatoes. Recent studies in 2003 discovered that the immune system supports bio-film development in the large intestine. This was supported mainly with the fact that the two most abundantly produced molecules by the immune system also support bio-film production and are associated with the bio-films developed in the gut. This is especially important because the appendix holds a mass amount of these bacterial bio-films. This discovery helps to distinguish the possible function of the appendix and the idea that the appendix can help reinoculate the gut with good gut flora. In the human environment, biofilms can grow in showers very easily since they provide a moist and warm environment for the biofilm to thrive. Biofilms can form inside water and sewage pipes and cause clogging and corrosion. Biofilms on floors and counters can make sanitation difficult in food preparation areas. Biofilm in soil can cause bioclogging. Biofilms in cooling- or heating-water systems are known to reduce heat transfer. Biofilms in marine engineering systems, such as pipelines of the offshore oil and gas industry, can lead to substantial corrosion problems. Corrosion is mainly due to abiotic factors; however, at least 20% of corrosion is caused by microorganisms that are attached to the metal subsurface (i.e., microbially influenced corrosion). Bacterial adhesion to boat hulls serves as the foundation for biofouling of seagoing vessels. Once a film of bacteria forms, it is easier for other marine organisms such as barnacles to attach. Such fouling can reduce maximum vessel speed by up to 20%, prolonging voyages and consuming fuel. Time in dry dock for refitting and repainting reduces the productivity of shipping assets, and the useful life of ships is also reduced due to corrosion and mechanical removal (scraping) of marine organisms from ships' hulls. Stromatolites are layered accretionary structures formed in shallow water by the trapping, binding and cementation of sedimentary grains by microbial biofilms, especially of cyanobacteria. Stromatolites include some of the most ancient records of life on Earth, and are still forming today. Within the human body, biofilms are present on the teeth as dental plaque, where they may cause tooth decay and gum disease. These biofilms can either be in an uncalcified state that can be removed by dental instruments, or a calcified state which is more difficult to remove. Removal techniques can also include antimicrobials. Dental plaque is an oral biofilm that adheres to the teeth and consists of many species of both bacteria and fungi (such as Streptococcus mutans and Candida albicans), embedded in salivary polymers and microbial extracellular products. The accumulation of microorganisms subjects the teeth and gingival tissues to high concentrations of bacterial metabolites which results in dental disease. Biofilm on the surface of teeth is frequently subject to oxidative stress and acid stress. Dietary carbohydrates can cause a dramatic decrease in pH in oral biofilms to values of 4 and below (acid stress). A pH of 4 at body temperature of 37 °C causes depurination of DNA, leaving apurinic (AP) sites in DNA, especially loss of guanine. The dental plaque biofilm can result in the disease dental caries if it is allowed to develop over time. An ecologic shift away from balanced populations within the dental biofilm is driven by certain (cariogenic) microbiological populations beginning to dominate when the environment favours them. The shift to an acidogenic, aciduric, and cariogenic microbiological population develops and is maintained by frequent consumption of fermentable dietary carbohydrate. The resulting activity shift in the biofilm (and resulting acid production within the biofilm, at the tooth surface) is associated with an imbalance between demineralization and remineralisation leading to net mineral loss within dental hard tissues (enamel and then dentin), the sign and symptom being a carious lesion. By preventing the dental plaque biofilm from maturing or by returning it back to a non-cariogenic state, dental caries can be prevented and arrested. This can be achieved though the behavioural step of reducing the supply of fermentable carbohydrates (i.e. sugar intake) and frequent removal of the biofilm (i.e. toothbrushing). A peptide pheromone quorum sensing signaling system in S. mutans includes the Competence Stimulating Peptide (CSP) that controls genetic competence. Genetic competence is the ability of a cell to take up DNA released by another cell. Competence can lead to genetic transformation, a form of sexual interaction, favored under conditions of high cell density and/or stress where there is maximal opportunity for interaction between the competent cell and the DNA released from nearby donor cells. This system is optimally expressed when S. mutans cells reside in an actively growing biofilm. Biofilm grown S. mutans cells are genetically transformed at a rate 10- to 600-fold higher than S. mutans growing as free-floating planktonic cells suspended in liquid. When the biofilm, containing S. mutans and related oral streptococci, is subjected to acid stress, the competence regulon is induced, leading to resistance to being killed by acid. As pointed out by Michod et al., transformation in bacterial pathogens likely provides for effective and efficient recombinational repair of DNA damages. It appears that S. mutans can survive the frequent acid stress in oral biofilms, in part, through the recombinational repair provided by competence and transformation. Many different bacteria form biofilms, including gram-positive (e.g. Bacillus spp, Listeria monocytogenes, Staphylococcus spp, and lactic acid bacteria, including Lactobacillus plantarum and Lactococcus lactis) and gram-negative species (e.g. Escherichia coli, or Pseudomonas aeruginosa). Cyanobacteria also form biofilms in aquatic environments. Biofilms are formed by bacteria that colonize plants, e.g. Pseudomonas putida, Pseudomonas fluorescens, and related pseudomonads which are common plant-associated bacteria found on leaves, roots, and in the soil, and the majority of their natural isolates form biofilms. Several nitrogen-fixing symbionts of legumes such as Rhizobium leguminosarum and Sinorhizobium meliloti form biofilms on legume roots and other inert surfaces. Along with bacteria, biofilms are also generated by archaea and by a range of eukaryotic organisms, including fungi e.g. Cryptococcus laurentii and microalgae. Among microalgae, one of the main progenitors of biofilms are diatoms, which colonise both fresh and marine environments worldwide. For other species in disease-associated biofilms and biofilms arising from eukaryotes see below. Biofilms have been found to be involved in a wide variety of microbial infections in the body, by one estimate 80% of all infections. 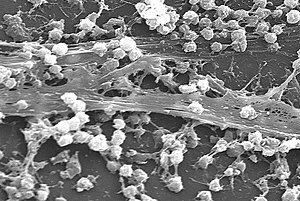 Infectious processes in which biofilms have been implicated include common problems such as bacterial vaginosis, urinary tract infections, catheter infections, middle-ear infections, formation of dental plaque, gingivitis, coating contact lenses, and less common but more lethal processes such as endocarditis, infections in cystic fibrosis, and infections of permanent indwelling devices such as joint prostheses, heart valves, and intervertebral disc. More recently it has been noted that bacterial biofilms may impair cutaneous wound healing and reduce topical antibacterial efficiency in healing or treating infected skin wounds. Early detection of biofilms in wounds is crucial to successful chronic wound management. Although many techniques have developed to identify planktonic bacteria in viable wounds, few have been able to quickly and accurately identify bacterial biofilms. Future studies are needed to find means of identifying and monitoring biofilm colonization at the bedside to permit timely initiation of treatment. It has recently been shown that biofilms are present on the removed tissue of 80% of patients undergoing surgery for chronic sinusitis. The patients with biofilms were shown to have been denuded of cilia and goblet cells, unlike the controls without biofilms who had normal cilia and goblet cell morphology. Biofilms were also found on samples from two of 10 healthy controls mentioned. The species of bacteria from intraoperative cultures did not correspond to the bacteria species in the biofilm on the respective patient's tissue. In other words, the cultures were negative though the bacteria were present. New staining techniques are being developed to differentiate bacterial cells growing in living animals, e.g. from tissues with allergy-inflammations. Research has shown that sub-therapeutic levels of β-lactam antibiotics induce biofilm formation in Staphylococcus aureus. This sub-therapeutic level of antibiotic may result from the use of antibiotics as growth promoters in agriculture, or during the normal course of antibiotic therapy. The biofilm formation induced by low-level methicillin was inhibited by DNase, suggesting that the sub-therapeutic levels of antibiotic also induce extracellular DNA release. Moreover, from an evolutionary point of view, the creation of the tragedy of the commons in pathogenic microbes may provide advanced therapeutic ways for chronic infections caused by biofilms via genetically engineered invasive cheaters who can invade wild-types ‘cooperators’ of pathogenic bacteria until cooperator populations go to extinction or overall population ‘cooperators and cheaters ’ go to extinction. P. aeruginosa represents a commonly used biofilm model organism since it is involved in different types of biofilm-associated infections. Examples of such infections include chronic wounds, chronic otitis media, chronic prostatitis and chronic lung infections in cystic fibrosis (CF) patients. About 80% of CF patients have chronic lung infection, caused mainly by P. aeruginosa growing in a non-surface attached biofilms surround by PMN. The infection remains present despite aggressive antibiotic therapy and is a common cause of death in CF patients due to constant inflammatory damage to the lungs. In patients with CF, one therapy for treating early biofilm development is to employ DNase to structurally weaken the biofilm. S. pneumoniae is the main cause of community-acquired pneumonia and meningitis in children and the elderly, and of septicemia in HIV-infected persons. When S. pneumonia grows in biofilms, genes are specifically expressed that respond to oxidative stress and induce competence. Formation of a biofilm depends on competence stimulating peptide (CSP). CSP also functions as a quorum-sensing peptide. It not only induces biofilm formation, but also increases virulence in pneumonia and meningitis. It has been proposed that competence development and biofilm formation is an adaptation of S. pneumoniae to survive the defenses of the host. In particular, the host’s polymorphonuclear leukocytes produce an oxidative burst to defend against the invading bacteria, and this response can kill bacteria by damaging their DNA. Competent S. pneumoniae in a biofilm have the survival advantage that they can more easily take up transforming DNA from nearby cells in the biofilm to use for recombinational repair of oxidative damages in their DNA. Competent S. pneumoniae can also secrete an enzyme (murein hydrolase) that destroys non-competent cells (fratricide) causing DNA to be released into the surrounding medium for potential use by the competent cells. Infections associated with the biofilm growth usually are challenging to eradicate. This is mostly due to the fact that mature biofilms display tolerance towards antibiotics and the immune response. Biofilms often form on the inert surfaces of implanted devices such as catheters, prosthetic cardiac valves and intrauterine devices. The rapidly expanding worldwide industry for biomedical devices and tissue engineering related products is already at $180 billion per year, yet this industry continues to suffer from microbial colonization. No matter the sophistication, microbial infections can develop on all medical devices and tissue engineering constructs. 60-70% of nosocomial or hospital acquired infections are associated with the implantation of a biomedical device. This leads to 2 million cases annually in the U.S., costing the healthcare system over $5 billion in additional healthcare expenses. Biofilms have become problematic in several food industries due to the ability to form on plants and during industrial processes. Bacteria can survive long periods of time in water, animal manure, and soil, causing biofilm formation on plants or in the processing equipment. The buildup of biofilms can affect the heat flow across a surface and increase surface corrosion and frictional resistance of fluids. These can lead to a loss of energy in a system and overall loss of products. Along with economic problems, biofilm formation on food poses a health risk to consumers due to the ability to make the food more resistant to disinfectants As a result, from 1996 to 2010 the Center for Disease Control and Prevention estimated 48 million foodborne illnesses per year. Biofilms have been connected to about 80% of bacterial infections in the United States. In produce, microorganisms attach to the surfaces and biofilms develop internally. During the washing process, biofilms resist sanitization and allow bacteria to spread across the produce. This problem is also found in ready-to-eat foods, because the foods go through limited cleaning procedures before consumption Due to the perishability of dairy products and limitations in cleaning procedures, resulting in the buildup of bacteria, dairy is susceptible to biofilm formation and contamination. The bacteria can spoil the products more readily and contaminated products pose a health risk to consumers. One bacteria that can be found in various industries and is a major cause of foodborne disease is Salmonella. Large amounts of salmonella contamination can be found in the poultry processing industry as about 50% of salmonella strains can produce biofilms on poultry farms. Salmonella increases the risk of foodborne illnesses when the poultry products are not cleaned and cooked correctly. Salmonella is also found in the seafood industry where biofilms form from seafood borne pathogens on the seafood itself as well as in water. Shrimp products are commonly affected by salmonella because of unhygienic processing and handling techniques The preparation practices of shrimp and other seafood products can allow for bacteria buildup on the products. New forms of cleaning procedures are being tested in order to reduce biofilm formation in these processes which will lead to safer and more productive food processing industries. These new forms of cleaning procedures also have a profound effect on the environment, often releasing toxic gases into the groundwater reservoirs. In shellfish and algae farms, biofouling microbial species tend to block nets and cages and ultimately outcompete the farmed species for space and food. Bacterial biofilms start the colonization process by creating microenvironments that are more favorable for biofouling species. In the marine environment, biofilms could reduce the hydrodynamic efficiency of ships and propellers, lead to pipeline blockage and sensor malfunction, and increase the weight of appliances deployed in seawater. Numerous studies have shown that biofilm can be a reservoir for potentially pathogenic bacteria in freshwater aquaculture. As mentioned previously, biofilms can be difficult to eliminate even when antibiotics or chemicals are used in high doses. The role that biofilm plays as reservoirs of bacterial fish pathogens has not been explored in detail but it certainly deserves to be studied. Along with bacteria, biofilms are often initiated and produced by eukaryotic microbes. The biofilms produced by eukaryotes is usually occupied by bacteria and other eukaryotes alike, however the surface is cultivated and EPS is secreted initially by the eukaryote. Both fungi and microalgae are known to form biofilms in such a way. Biofilms of fungal origin are important aspects of human infection and fungal pathagenicity, as the fungal infection is more resistant to antifungals. In the environment, fungal biofilms are an area of ongoing research. One key area of research is fungal biofilms on plants. For example, in the soil, plant associated fungi including mycorrhiza have been shown to decompose organic matter, protect plants from bacterial pathogens. Biofilms in aquatic environments are often founded by diatoms. The exact purpose of these biofilms is unknown, however there is evidence that the EPS produced by diatoms facilitates both cold and salinity stress. These eukaryotes interact with a diverse range of other organisms within a region known as the phycosphere, but importantly are the bacteria associated with diatoms, as it has been shown that although diatoms excrete EPS, they only do so when interacting with certain bacteria species. ^ a b c d López, Daniel; Vlamakis, Hera; Kolter, Roberto (2010). "Biofilms". Cold Spring Harbor Perspectives in Biology. 2 (7): a000398. doi:10.1101/cshperspect.a000398. ISSN 1943-0264. PMC 2890205. PMID 20519345. ^ a b c d Hall-Stoodley L, Costerton JW, Stoodley P (February 2004). "Bacterial biofilms: from the natural environment to infectious diseases". Nature Reviews Microbiology. 2 (2): 95–108. doi:10.1038/nrmicro821. PMID 15040259. ^ a b Aggarwal, S; Stewart, P; Hozalski, R (January 2016). "Biofilm Cohesive Strength as a Basis for Biofilm Recalcitrance: Are Bacterial Biofilms Overdesigned?". Microbiology Insights. 8 (Suppl 2): 29–32. doi:10.4137/MBI.S31444. PMC 4718087. PMID 26819559. ^ a b Watnick, P.; Kolter, R. (May 2000). "Biofilm, city of microbes". Journal of Bacteriology. 182 (10): 2675–2679. doi:10.1128/jb.182.10.2675-2679.2000. ISSN 0021-9193. PMC 101960. PMID 10781532. ^ "Building Codes for Bacterial Cities | Quanta Magazine". Quanta Magazine. Retrieved 2017-07-25. ^ a b Lear G, Lewis GD, eds. (2012). Microbial Biofilms: Current Research and Applications. Caister Academic Press. ISBN 978-1-904455-96-7. ^ a b O'Toole, G. A.; Kolter, R. (May 1998). "Initiation of biofilm formation in Pseudomonas fluorescens WCS365 proceeds via multiple, convergent signalling pathways: a genetic analysis". Molecular Microbiology. 28 (3): 449–461. doi:10.1046/j.1365-2958.1998.00797.x. ISSN 0950-382X. PMID 9632250. ^ O'Toole, G. A.; Kolter, R. (October 1998). "Flagellar and twitching motility are necessary for Pseudomonas aeruginosa biofilm development". Molecular Microbiology. 30 (2): 295–304. doi:10.1046/j.1365-2958.1998.01062.x. ISSN 0950-382X. PMID 9791175. ^ Karatan E, Watnick P (June 2009). "Signals, regulatory networks, and materials that build and break bacterial biofilms". Microbiology and Molecular Biology Reviews. 73 (2): 310–47. doi:10.1128/MMBR.00041-08. PMC 2698413. PMID 19487730. ^ An D, Parsek MR (June 2007). "The promise and peril of transcriptional profiling in biofilm communities". Current Opinion in Microbiology. 10 (3): 292–6. doi:10.1016/j.mib.2007.05.011. PMID 17573234. ^ Briandet R, Herry J, Bellon-Fontaine M (August 2001). "Determination of the van der Waals, electron donor and electron acceptor surface tension components of static Gram-positive microbial biofilms". Colloids Surf B Biointerfaces. 21 (4): 299–310. doi:10.1016/S0927-7765(00)00213-7. PMID 11397632. ^ Takahashi H, Suda T, Tanaka Y, Kimura B (June 2010). "Cellular hydrophobicity of Listeria monocytogenes involves initial attachment and biofilm formation on the surface of polyvinyl chloride". Lett. Appl. Microbiol. 50 (6): 618–25. doi:10.1111/j.1472-765X.2010.02842.x. PMID 20438621. ^ a b c Donlan RM (2002). "Biofilms: Microbial Life on Surfaces". Emerging Infectious Diseases. 8 (9): 881–890. doi:10.3201/eid0809.020063. PMC 2732559. PMID 12194761. ^ O'Toole, G.; Kaplan, H. B.; Kolter, R. (2000). "Biofilm formation as microbial development". Annual Review of Microbiology. 54: 49–79. doi:10.1146/annurev.micro.54.1.49. ISSN 0066-4227. PMID 11018124. ^ Monroe, Don (2007). "Looking for Chinks in the Armor of Bacterial Biofilms". PLoS Biology. 5 (11): e307. doi:10.1371/journal.pbio.0050307. ISSN 1545-7885. PMC 2071939. PMID 18001153. ^ Kaplan JB, Ragunath C, Ramasubbu N, Fine DH (August 2003). "Detachment of Actinobacillus actinomycetemcomitans biofilm cells by an endogenous beta-hexosaminidase activity". Journal of Bacteriology. 185 (16): 4693–8. doi:10.1128/JB.185.16.4693-4698.2003. PMC 166467. PMID 12896987. ^ Izano EA, Amarante MA, Kher WB, Kaplan JB (January 2008). "Differential roles of poly-N-acetylglucosamine surface polysaccharide and extracellular DNA in Staphylococcus aureus and Staphylococcus epidermidis biofilms". Applied and Environmental Microbiology. 74 (2): 470–6. doi:10.1128/AEM.02073-07. PMC 2223269. PMID 18039822. ^ Kaplan JB, Ragunath C, Velliyagounder K, Fine DH, Ramasubbu N (July 2004). "Enzymatic detachment of Staphylococcus epidermidis biofilms". Antimicrobial Agents and Chemotherapy. 48 (7): 2633–6. doi:10.1128/AAC.48.7.2633-2636.2004. PMC 434209. PMID 15215120. ^ Xavier JB, Picioreanu C, Rani SA, van Loosdrecht MC, Stewart PS (December 2005). "Biofilm-control strategies based on enzymic disruption of the extracellular polymeric substance matrix--a modelling study". Microbiology. 151 (Pt 12): 3817–32. doi:10.1099/mic.0.28165-0. PMID 16339929. ^ Davies DG, Marques CN (March 2009). "A fatty acid messenger is responsible for inducing dispersion in microbial biofilms". Journal of Bacteriology. 191 (5): 1393–403. doi:10.1128/JB.01214-08. PMC 2648214. PMID 19074399. ^ Barraud N, Hassett DJ, Hwang SH, Rice SA, Kjelleberg S, Webb JS (2006). "Involvement of nitric oxide in biofilm dispersal of Pseudomonas aeruginosa". Journal of Bacteriology. 188 (21): 7344–7353. doi:10.1128/jb.00779-06. PMC 1636254. PMID 17050922. ^ Barraud N, Storey MV, Moore ZP, Webb JS, Rice SA, Kjelleberg S (2009). "Nitric oxide-mediated dispersal in single- and multi-species biofilms of clinically and industrially relevant microorganisms". Microbial Biotechnology. 2 (3): 370–378. doi:10.1111/j.1751-7915.2009.00098.x. PMC 3815757. PMID 21261931. ^ "Dispersal of Biofilm in Cystic Fibrosis using Low Dose Nitric Oxide". University of Southampton. Retrieved 20 January 2012. ^ a b Chua SL, Liu Y, Yam JK, Tolker-Nielsen T, Kjelleberg S, Givskov M, Yang L (2014). "Dispersed cells represent a distinct stage in the transition from bacterial biofilm to planktonic lifestyles". Nature Communications. 5: 4462. Bibcode:2014NatCo...5E4462C. doi:10.1038/ncomms5462. PMID 25042103. ^ Chua SL, Hultqvist LD, Yuan M, Rybtke M, Nielsen TE, Givskov M, Tolker-Nielsen T, Yang L (August 2015). "In vitro and in vivo generation and characterization of Pseudomonas aeruginosa biofilm-dispersed cells via c-di-GMP manipulation". Nat Protoc. 10 (8): 1165–80. doi:10.1038/nprot.2015.067. PMID 26158442. ^ Nadell, Carey D.; Xavier, Joao B.; Foster, Kevin R. (1 January 2009). "The sociobiology of biofilms". FEMS Microbiology Reviews. 33 (1): 206–224. doi:10.1111/j.1574-6976.2008.00150.x. PMID 19067751. ^ Danese, P. N.; Pratt, L. A.; Kolter, R. (June 2000). "Exopolysaccharide production is required for development of Escherichia coli K-12 biofilm architecture". Journal of Bacteriology. 182 (12): 3593–3596. doi:10.1128/jb.182.12.3593-3596.2000. ISSN 0021-9193. PMC 101973. PMID 10852895. ^ Branda, Steven S.; Chu, Frances; Kearns, Daniel B.; Losick, Richard; Kolter, Roberto (February 2006). "A major protein component of the Bacillus subtilis biofilm matrix". Molecular Microbiology. 59 (4): 1229–1238. doi:10.1111/j.1365-2958.2005.05020.x. ISSN 0950-382X. PMID 16430696. ^ Choong, Ferdinand X; Bäck, Marcus; Fahlén, Sara; Johansson, Leif BG; Melican, Keira; Rhen, Mikael; Nilsson, K Peter R; Richter-Dahlfors, Agneta (23 November 2016). "Real-time optotracing of curli and cellulose in live Salmonella biofilms using luminescent oligothiophenes". Npj Biofilms and Microbiomes. 2: 16024. doi:10.1038/npjbiofilms.2016.24. PMC 5515270. PMID 28721253. Retrieved 24 November 2016. ^ Stoodley, Paul; Dirk deBeer; Zbigniew Lewandowski (August 1994). "Liquid Flow in Biofilm Systems". Appl. Environ. Microbiol. 60 (8): 2711–2716. PMC 201713. PMID 16349345. ^ Vlamakis, Hera; Aguilar, Claudio; Losick, Richard; Kolter, Roberto (2008-04-01). "Control of cell fate by the formation of an architecturally complex bacterial community". Genes & Development. 22 (7): 945–953. doi:10.1101/gad.1645008. ISSN 0890-9369. PMC 2279205. PMID 18381896. ^ Stewart PS, Costerton JW (July 2001). "Antibiotic resistance of bacteria in biofilms". Lancet. 358 (9276): 135–8. doi:10.1016/S0140-6736(01)05321-1. PMID 11463434. ^ a b Chimileski, Scott; Franklin, Michael J.; Papke, R. Thane (2014-08-14). "Biofilms formed by the archaeon Haloferax volcanii exhibit cellular differentiation and social motility, and facilitate horizontal gene transfer". BMC Biology. 12: 65. doi:10.1186/s12915-014-0065-5. ISSN 1741-7007. PMC 4180959. PMID 25124934. ^ Molin S, Tolker-Nielsen T (June 2003). "Gene transfer occurs with enhanced efficiency in biofilms and induces enhanced stabilisation of the biofilm structure". Current Opinion in Biotechnology. 14 (3): 255–61. doi:10.1016/S0958-1669(03)00036-3. PMID 12849777. ^ Jakubovics NS, Shields RC, Rajarajan N, Burgess JG (December 2013). "Life after death: the critical role of extracellular DNA in microbial biofilms". Lett. Appl. Microbiol. 57 (6): 467–75. doi:10.1111/lam.12134. PMID 23848166. ^ Spoering AL, Lewis K (December 2001). "Biofilms and planktonic cells of Pseudomonas aeruginosa have similar resistance to killing by antimicrobials". Journal of Bacteriology. 183 (23): 6746–51. doi:10.1128/JB.183.23.6746-6751.2001. PMC 95513. PMID 11698361. ^ Andersen PC, Brodbeck BV, Oden S, Shriner A, Leite B (September 2007). "Influence of xylem fluid chemistry on planktonic growth, biofilm formation and aggregation of Xylella fastidiosa". FEMS Microbiology Letters. 274 (2): 210–7. doi:10.1111/j.1574-6968.2007.00827.x. PMID 17610515. ^ Bollinger, Randal; Barbas, Andrew; Bush, Errol; Lin, Shu; Parker, William (24 June 2007). "Biofilms in the large bowel suggest an apparent function of the human vermiform appendix" (PDF). Journal of Theoretical Biology. 249 (4): 826–831. doi:10.1016/j.jtbi.2007.08.032. PMID 17936308. ^ Characklis, WG; Nevimons, MJ; Picologlou, BF (1981). "Influence of Fouling Biofilms on Heat Transfer". Heat Transfer Engineering. 3: 23–37. doi:10.1080/01457638108939572. ^ Schwermer CU, Lavik G, Abed RM, et al. (May 2008). "Impact of nitrate on the structure and function of bacterial biofilm communities in pipelines used for injection of seawater into oil fields". Applied and Environmental Microbiology. 74 (9): 2841–51. doi:10.1128/AEM.02027-07. PMC 2394879. PMID 18344353. ^ Chandki, Rita; Banthia, Priyank; Banthia, Ruchi (2011). "Biofilms: A microbial home". Journal of Indian Society of Periodontology. 15 (2): 111–114. doi:10.4103/0972-124X.84377. ISSN 0972-124X. PMC 3183659. PMID 21976832. ^ Marquis RE (September 1995). "Oxygen metabolism, oxidative stress and acid-base physiology of dental plaque biofilms". Journal of Industrial Microbiology. 15 (3): 198–207. doi:10.1007/bf01569826. PMID 8519478. ^ a b c Lemos JA, Abranches J, Burne RA (January 2005). "Responses of cariogenic streptococci to environmental stresses" (PDF). Curr. Issues Mol. Biol. 7 (1): 95–107. PMID 15580782. ^ TAMM C, HODES ME, CHARGAFF E (March 1952). "The formation apurinic acid from the desoxyribonucleic acid of calf thymus". J. Biol. Chem. 195 (1): 49–63. PMID 14938354. ^ FREESE EB (April 1961). "Transitions and transversions induced by depurinating agents". Proc. Natl. Acad. Sci. U.S.A. 47 (4): 540–5. Bibcode:1961PNAS...47..540B. doi:10.1073/pnas.47.4.540. PMC 221484. PMID 13701660. ^ Fejerskov, Ole (2015). Pathology of dental caries. In: Dental caries: the disease and its clinical management. Oxford (UK): Wiley Blackwell. pp. 7–9. ISBN 978-1405138895. ^ a b Li YH, Lau PC, Lee JH, Ellen RP, Cvitkovitch DG (February 2001). "Natural genetic transformation of Streptococcus mutans growing in biofilms". J. Bacteriol. 183 (3): 897–908. doi:10.1128/JB.183.3.897-908.2001. PMC 94956. PMID 11208787. ^ Senadheera D, Cvitkovitch DG (2008). Quorum sensing and biofilm formation by Streptococcus mutans. Adv. Exp. Med. Biol. Advances in Experimental Medicine and Biology. 631. pp. 178–88. doi:10.1007/978-0-387-78885-2_12. ISBN 978-0-387-78884-5. PMID 18792689. ^ Abee, T; Kovács, A. T.; Kuipers, O. P.; Van Der Veen, S (2011). "Biofilm formation and dispersal in Gram-positive bacteria" (PDF). Current Opinion in Biotechnology. 22 (2): 172–9. doi:10.1016/j.copbio.2010.10.016. PMID 21109420. ^ a b Danhorn, T; Fuqua, C (2007). "Biofilm formation by plant-associated bacteria". Annual Review of Microbiology. 61: 401–22. doi:10.1146/annurev.micro.61.080706.093316. PMID 17506679. ^ a b Joubert LM, Wolfaardt GM, Botha A (August 2006). "Microbial exopolymers link predator and prey in a model yeast biofilm system". Microb. Ecol. 52 (2): 187–97. doi:10.1007/s00248-006-9063-7. PMID 16897306. ^ a b Van Colen C, Underwood GC, Serôdio J, Paterson DM (2014). "Ecology of intertidal microbial biofilms: Mechanisms, patterns and future research needs". Journal of Sea Research. 92: 2–5. Bibcode:2014JSR....92....2V. doi:10.1016/j.seares.2014.07.003. ^ a b Aslam SN, Cresswell-Maynard T, Thomas DN, Underwood GJ (December 2012). "Production and Characterization of the Intra- and Extracellular Carbohydrates and Polymeric Substances (EPS) of Three Sea-Ice Diatom Species, and Evidence for a Cryoprotective Role for EPS". J. Phycol. 48 (6): 1494–509. doi:10.1111/jpy.12004. PMID 27009999. ^ "Research on microbial biofilms (PA-03-047)". NIH, National Heart, Lung, and Blood Institute. 2002-12-20. ^ Rogers, Anthony (2008). Molecular Oral Microbiology. Caister Academic Press. pp. 88–91. ISBN 978-1-904455-24-0. ^ Imamura Y, Chandra J, Mukherjee PK, et al. (January 2008). "Fusarium and Candida albicans biofilms on soft contact lenses: model development, influence of lens type, and susceptibility to lens care solutions". Antimicrobial Agents and Chemotherapy. 52 (1): 171–82. doi:10.1128/AAC.00387-07. PMC 2223913. PMID 17999966. ^ Capoor, Manu N.; Ruzicka, Filip; Schmitz, Jonathan E.; James, Garth A.; Machackova, Tana; Jancalek, Radim; Smrcka, Martin; Lipina, Radim; Ahmed, Fahad S. (2017-04-03). "Propionibacterium acnes biofilm is present in intervertebral discs of patients undergoing microdiscectomy". PLOS ONE. 12 (4): e0174518. Bibcode:2017PLoSO..1274518C. doi:10.1371/journal.pone.0174518. ISSN 1932-6203. PMC 5378350. PMID 28369127. ^ Lewis K (April 2001). "Riddle of biofilm resistance". Antimicrobial Agents and Chemotherapy. 45 (4): 999–1007. doi:10.1128/AAC.45.4.999-1007.2001. PMC 90417. PMID 11257008. ^ Parsek MR, Singh PK (2003). "Bacterial biofilms: an emerging link to disease pathogenesis". Annual Review of Microbiology. 57: 677–701. doi:10.1146/annurev.micro.57.030502.090720. PMID 14527295. ^ Davis SC, Ricotti C, Cazzaniga A, Welsh E, Eaglstein WH, Mertz PM (2008). "Microscopic and physiologic evidence for biofilm-associated wound colonization in vivo". Wound Repair and Regeneration. 16 (1): 23–9. doi:10.1111/j.1524-475X.2007.00303.x. PMID 18211576. ^ Vyas KS, Wong LK (2016). "Detection of Biofilm in Wounds as an Early Indicator for Risk for Tissue Infection and Wound Chronicity". Annals of Plastic Surgery. 76 (1): 127–31. doi:10.1097/SAP.0000000000000440. PMID 25774966. ^ Sanclement J, Webster P, Thomas J, Ramadan H (2005). "Bacterial biofilms in surgical specimens of patients with chronic rhinosinusitis". The Laryngoscope. 115 (4): 578–82. doi:10.1097/01.mlg.0000161346.30752.18. PMID 15805862. ^ Sanderson AR, Leid JG, Hunsaker D (July 2006). "Bacterial biofilms on the sinus mucosa of human subjects with chronic rhinosinusitis". The Laryngoscope. 116 (7): 1121–6. doi:10.1097/01.mlg.0000221954.05467.54. PMID 16826045. ^ Leevy WM, Gammon ST, Jiang H, et al. (December 2006). "Optical imaging of bacterial infection in living mice using a fluorescent near-infrared molecular probe". Journal of the American Chemical Society. 128 (51): 16476–7. doi:10.1021/ja0665592. PMC 2531239. PMID 17177377. ^ Kaplan JB, Izano EA, Gopal P, et al. (2012). "Low Levels of β-Lactam Antibiotics Induce Extracellular DNA Release and Biofilm Formation in Staphylococcus aureus". mBio. 3 (4): e00198–12. doi:10.1128/mBio.00198-12. PMC 3419523. PMID 22851659. ^ a b Rybtke, Morten; Hultqvist, Louise Dahl; Givskov, Michael; Tolker-Nielsen, Tim (2015). "Pseudomonas aeruginosa Biofilm Infections: Community Structure, Antimicrobial Tolerance and Immune Response". Journal of Molecular Biology. 427 (23): 3628–3645. doi:10.1016/j.jmb.2015.08.016. PMID 26319792. ^ Ciofu, Oana; Tolker-Nielsen, Tim; Jensen, Peter Østrup; Wang, Hengzhuang; Høiby, Niels (2015). "Antimicrobial resistance, respiratory tract infections and role of biofilms in lung infections in cystic fibrosis patients". Advanced Drug Delivery Reviews. 85: 7–23. doi:10.1016/j.addr.2014.11.017. PMID 25477303. ^ Whitchurch, CB; Tolker-Nielsen, T; Ragas, PC; Mattick, JS (February 2018). "Extracellular DNA required for bacterial biofilm formation". Science. 295 (5559): 1487. doi:10.1126/science.295.5559.1487. PMID 11859186. Retrieved June 29, 2018. ^ Oggioni MR, Trappetti C, Kadioglu A, Cassone M, Iannelli F, Ricci S, Andrew PW, Pozzi G (September 2006). "Switch from planktonic to sessile life: a major event in pneumococcal pathogenesis". Mol. Microbiol. 61 (5): 1196–210. doi:10.1111/j.1365-2958.2006.05310.x. PMC 1618759. PMID 16925554. ^ Wei H, Håvarstein LS (August 2012). "Fratricide is essential for efficient gene transfer between pneumococci in biofilms". Appl. Environ. Microbiol. 78 (16): 5897–905. doi:10.1128/AEM.01343-12. PMC 3406168. PMID 22706053. ^ a b c d Bryers J. D. (2008). "Medical biofilms". Biotechnology and Bioengineering. 100 (1): 1–18. doi:10.1002/bit.21838. PMC 2706312. PMID 18366134. ^ Auler ME, Morreira D, Rodrigues FF, et al. (April 2009). "Biofilm formation on intrauterine devices in patients with recurrent vulvovaginal candidiasis". Medical Mycology. 48 (1): 211–6. doi:10.3109/13693780902856626. PMID 20055746. ^ Martins dos Santos VA, Yakimov MM, Timmis KN, Golyshin PN (2008). "Genomic Insights into Oil Biodegradation in Marine Systems". In Díaz E (ed.). Microbial Biodegradation: Genomics and Molecular Biology. Horizon Scientific Press. p. 1971. ISBN 978-1-904455-17-2. ^ Chua SL, Wang VB, Cai Z, Sivakumar K, Kjelleberg S, Cao B, Loo SC, Yang L (2014). "A stable synergistic microbial consortium for simultaneous azo dye removal and bioelectricity generation". Bioresource Technology. 155: 71–76. doi:10.1016/j.biortech.2013.12.078. PMID 24434696. ^ Chua SL, Wang VB, Cao B, Loo SC, Yang L (2013). "A stable synergistic microbial consortium for simultaneous azo dye removal and bioelectricity generation". PLoS ONE. 8 (5): e63129. Bibcode:2013PLoSO...863129W. doi:10.1371/journal.pone.0063129. PMC 3659106. PMID 23700414. ^ Zhang RY, Bellenberg S, Sand W, Neu TR, Vera M (2016). The Biofilm Lifestyle of Acidophilic Metal/Sulfur-Oxidizing Microorganisms. In: Biotechnology of Extremophiles: Advances and Challenges. Rampelotto Pabulo H (Ed.). Springer International Publishing, Cham, Switzerland. pp 177-213. ^ Vera M, Schippers A, Sand W (September 2013). "Progress in bioleaching: fundamentals and mechanisms of bacterial metal sulfide oxidation--part A". Appl. Microbiol. Biotechnol. 97 (17): 7529–41. doi:10.1007/s00253-013-4954-2. PMID 23720034. ^ a b c d e f g h i Srey S. "Biofilm formation in food industries: A food safety concern". ^ T. Tarver, "Biofilms: A Threat to Food Safety – IFT.org", Ift.org, 2016. ^ a b c d Kumar C. "Significance of microbial biofilms in food industry: a review". ^ a b c d Mizan F. "Microbial biofilms in seafood: A food-hygiene challenge". ^ Braithwaite R, McEvoy L (2004). Marine biofouling on fish farms and its remediation. Advances in Marine Biology. 47. pp. 215–252. doi:10.1016/S0065-2881(04)47003-5. ISBN 9780120261482. PMID 15596168. ^ Qian PY, Lau SC, Dahms HU, Dobretsov S, Harder T (2007). "Marine biofilms as mediators of colonization by marine macroorganisms: implications for antifouling and aquaculture". Mar. Biotechnol. 9 (4): 399–410. doi:10.1007/s10126-007-9001-9. PMID 17497196. ^ Cai W, De La Fuente L, Arias CR (September 2013). "Biofilm formation by the fish pathogen Flavobacterium columnare: development and parameters affecting surface attachment". Appl. Environ. Microbiol. 79 (18): 5633–42. doi:10.1128/AEM.01192-13. PMC 3754160. PMID 23851087. ^ King RK, Flick Jr GJ, Pierson D, Smith SA, Boardman GD, Coale Jr CW (2004). "Identification of bacterial pathogens in biofilms of recirculating aquaculture systems". Journal of Aquatic Food Product Technology. 13: 125–133. doi:10.1300/j030v13n01_11. ^ Bourne DG, Høj L, Webster NS, Swan J, Hall MR (2006). "Biofilm development within a larval rearing tank of the tropical rock lobster, Panulirus ornatus". Aquaculture. 260 (1–4): 27–38. doi:10.1016/j.aquaculture.2006.06.023. ^ Wietz M, Hall MR, Høj L (2009). "Effects of seawater ozonation on biofilm development in aquaculture tanks". Systematic and Applied Microbiology. 32 (4): 266–277. doi:10.1016/j.syapm.2009.04.001. PMID 19446976. ^ Karunasagar I, Pai R, Malathi G (1994). "Mass mortality of Penaeus monodon larvae due to antibiotic-resistant Vibrio harveyi infection". Aquaculture. 128 (3–4): 203–209. doi:10.1016/0044-8486(94)90309-3. ^ Lawrence JR, Korber DR, Hoyle BD, Costerton JW, Caldwell DE (October 1991). "Optical sectioning of microbial biofilms". J. Bacteriol. 173 (20): 6558–67. doi:10.1128/jb.173.20.6558-6567.1991. PMC 208993. PMID 1917879. ^ Cooksey K, Wigglesworth-Cooksey B (1995). "Adhesion of bacteria and diatoms to surfaces in the sea: a review". Aquatic Microbial Ecology. 9 (1): 87–96. doi:10.3354/ame009087. ^ Fanning S, Mitchell AP (2012). "Fungal Biofilms". PLoS Pathog. 8 (4): e1002585. doi:10.1371/journal.ppat.1002585. PMC 3320593. PMID 22496639. ^ Chandra J, Kuhn DM, Mukherjee PK, Hoyer LL, McCormick T, Ghannoum MA (September 2001). "Biofilm formation by the fungal pathogen Candida albicans: development, architecture, and drug resistance". J. Bacteriol. 183 (18): 5385–94. doi:10.1128/jb.183.18.5385-5394.2001. PMC 95423. PMID 11514524. ^ Microbial Biofilms: Current Research and Applications Burmølle, Mette; Kjøller, Annelise; Sørenses, Søren (2012). Lear, Gavin; Lewis, Gillian (eds.). Microbial Biofilms: Current Research and Applications. Horizon Scientific Press. pp. 61–71. ISBN 978-1904455967. ^ Steele DJ, Franklin DJ, Underwood GJ (September 2014). "Protection of cells from salinity stress by extracellular polymeric substances in diatom biofilms". Biofouling. 30 (8): 987–98. doi:10.1080/08927014.2014.960859. PMC 4706044. PMID 25268215. ^ Windler M, Leinweber K, Bartulos CR, Philipp B, Kroth PG (April 2015). "Biofilm and capsule formation of the diatom Achnanthidium minutissimum are affected by a bacterium". J. Phycol. 51 (2): 343–55. doi:10.1111/jpy.12280. PMID 26986529. ^ Buhmann M, Kroth PG, Schleheck D (February 2012). "Photoautotrophic-heterotrophic biofilm communities: a laboratory incubator designed for growing axenic diatoms and bacteria in defined mixed-species biofilms". Environ Microbiol Rep. 4 (1): 133–40. doi:10.1111/j.1758-2229.2011.00315.x. PMID 23757240. Ramadan HH, Sanclement JA, Thomas JG (March 2005). "Chronic rhinosinusitis and biofilms". Otolaryngology–Head and Neck Surgery. 132 (3): 414–7. doi:10.1016/j.otohns.2004.11.011. PMID 15746854. Bendouah Z, Barbeau J, Hamad WA, Desrosiers M (June 2006). "Biofilm formation by Staphylococcus aureus and Pseudomonas aeruginosa is associated with an unfavorable evolution after surgery for chronic sinusitis and nasal polyposis". Otolaryngology–Head and Neck Surgery. 134 (6): 991–6. doi:10.1016/j.otohns.2006.03.001. PMID 16730544. Lynch AS, Robertson GT (2008). "Bacterial and fungal biofilm infections". Annual Review of Medicine. 59: 415–28. doi:10.1146/annurev.med.59.110106.132000. PMID 17937586. Vo P, Nunez M (2010). "Bdellovibrio bacteriovorus Predation in Dual-Species Biofilms of E. coli Prey and M. luteus Decoys". arXiv:1005.3582 [q-bio.PE]. Allison, D. G. (2000). Community structure and co-operation in biofilms. Cambridge, UK: Cambridge University Press. ISBN 978-0-521-79302-5. Lynch, James F.; Lappin-Scott, Hilary M.; Costerton, J. W. (2003). Microbial biofilms. Cambridge, UK: Cambridge University Press. ISBN 978-0-521-54212-8. Chua SL, Liu Y, Yam JK, Tolker-Nielsen T, Kjelleberg S, Givskov M, Yang L (2014). "Dispersed cells represent a distinct stage in the transition from bacterial biofilm to planktonic lifestyles". Nature Communications. 5: 4462. Bibcode:2014NatCo...5E4462C. doi:10.1038/ncomms5462. PMID 25042103. Chua SL, Tolker-Nielsen T, Kjelleberg S, Givskov M, Yang L (2013). "Bis-(3′-5′)-cyclic dimeric GMP regulates antimicrobial peptide resistance in Pseudomonas aeruginosa". Antimicrobial Agents and Chemotherapy. 57 (5): 2066–2075. doi:10.1128/AAC.02499-12. PMC 3632963. PMID 23403434.